As we reach the end of another year, it’s time to take a look back over the rollercoaster that was 2018 in European gymnastics! The Russians shock everyone by failing to make the team final at the DTB Pokal event in Stuttgart. The Belgians win and the Swiss have the meet of their lives, finishing second. Nina Derwael blows us all away with a 15.3 on bars at the Doha World Cup. On the men’s side, Ukraine’s Igor Radivilov wins vault and rings, Russia’s Dmitrii Lankin takes gold on floor and Tin Srbic of Croatia wins high bar. GB’s Amy Tinkler injures her ankle while warming up for the Birmingham World Cup, taking her out of competition for the rest of the season. Alice Kinsella finishes in third place. 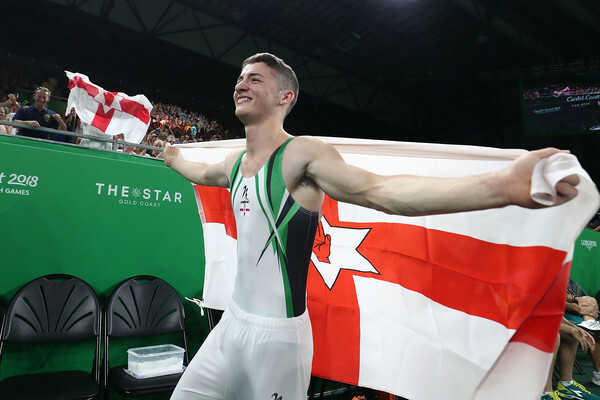 Nile Wilson wins the AA at the Commonwealth Games in Australia, with GB teammate James Hall finishing second. Courtney Tulloch wins gold on rings and Wilson also wins high bar. Ireland’s Rhys McClenaghan wins pommels, with a massive 15.100. Alice Kinsella wins AA bronze at Commonwealths and also wins beam, with Georgia-Mae Fenton taking gold on bars. England finish second in the team competition behind Canada. Russia’s Aliya Mustafina returns to competition following the birth of her daughter and qualifies for a bunch of finals, but ends up injuring her knee and is out again for several months. Angelina Melnikova is like a whole new gymnast and smashes everything, her ups and downs of 2017 long forgotten. Artur Dalaloyan wins the men’s AA. Italy’s Sydney Saturnino starts the Gymnastics Fail Challenge, which spreads like wildfire through Instagram, with gymnasts all over the world posting videos of their falls, near misses and comedy moments. Mélanie De Jesus Dos Santos wins the AA competition at the French Championships and Julien Gobaux takes gold in the MAG AA. The Koper World Cup takes place in Slovenia. Switzerland’s Giulia Steingruber wins vault, the commentator bizarrely having no idea who she is. Romania’s Denisa Golgota makes quite an impression in her first major competition as a senior and Slovakia’s Barbora Mokosova wins uneven bars. Commonwealth gold medallist Rhys McClenaghan is kicked out of his gymnastics club, along with his coach, and is forced to train in his garden. Italy’s Lara Mori wins the AA at the Mediterranean Games in Tarragona and the Italians also win the team competition, with France and Spain putting up a good fight to finish second and third. The drama continues between Marian Dragulescu and the Romanian federation, who refused to send him to the European Championships due to his alleged heart condition. The European Championships take place in Glasgow. It’s an amazing experience, despite a huge number of gymnasts being out with injuries, particularly on the WAG side. There isn’t a dry eye in the house when Boglarka Devai wins vault. Nina Derwael gets a well-deserved bars gold with a beautiful routine, Sanne Wevers wins beam following last year’s disappointment, and Mélanie De Jesus Dos Santos is the new floor champion. Russia wins the team competition. On the MAG side, Great Britain’s Dom Cunningham gets a surprise gold on floor. Rhys McClenaghan of Ireland looks unstoppable on pommels, winning with a huge 15.3. Greece’s Eleftherios Petrounias wins rings, Artur Dalaloyan of Russia becomes vault and parallel bars champion and Switzerland’s Oliver Hegi gets the gold on high bar with this gorgeous routine. Russia wins the team competition. 1988 Olympic champion Yelena Shushunova dies at the age of 49 due to complications from pneumonia. The Szombathely World Cup takes place. Israel’s Ofir Netzer gets the gold on vault, Jonna Adlerteg of Sweden wins bars, Hungary’s Zsofia Kovacs comes first on beam and Dorina Böczögö, also of Hungary, wins floor. Pablo Braegger becomes Swiss national champion. On the WAG side, Ilaria Kaeslin takes the AA title. European gymnasts dominate at the Youth Olympics in Buenos Aires, with Italy’s Giorgia Villa winning the all around competition. Great Britain’s Amelie Morgan comes in second and Ukraine’s Anastasiia Bachynska takes the bronze. The World Championships kick off in Doha. It’s not a great start, with heavy rain causing flooding in the streets and inside the arena. Nina Derwael is now the world uneven bars champion and Elisabeth Seitz finally gets a Worlds bars medal! Aliya Mustafina is back and comes fifth on bars, and Angelina Melnikova is devastated to miss out on a bronze on floor. In the WAG team competition, France and Germany are the only European nations to make the final, finishing fifth and eighth. The following European WAG teams qualify to next year’s Worlds – France, Germany, Great Britain, the Netherlands, Belgium, Italy, Romania, Hungary, Spain, Ukraine, Switzerland, Poland and the Czech Republic. Congratulations! Greece’s Vasiliki Millousi retires from gymnastics, at the age of 34. The FIG bans face paint and uses a photo of Céline van Gerner in case anyone was in any doubt as to what motivated that decision. Twitter is not happy. Team Germany (Elisabeth Seitz and Marcel Nguyen) win the Swiss Cup. The Cottbus World Cup takes place, with a gold on bars for Belgium’s Nina Derwael. Ukraine’s Diana Varinska takes bronze on beam and Marta Pihan-Kulesza gets a surprise bronze on floor, with her resurrected Pink Panther routine. On the MAG side, Artem Dolgopyat wins floor, with Casimir Schmidt of the Netherlands coming in second. France’s Samir Aït Saïd gets rings silver, Igor Radivilov of Ukraine wins vault and his teammate Oleg Verniaiev gets the gold on parallel bars. Team NL’s Epke Zonderland wins high bar, leaving last year’s world champ Tin Srbic of Croatia to settle for silver. Diana Varinska gets the gold at the Joaquin Blume memorial, with Hungary’s Zsofia Kovacs coming in second and Russia’s Angelina Simakova getting the bronze. In the MAG competition, Russia’s Artur Dalaloyan wins, with Spain’s Nestor Abad coming in third. Great Britain’s Gabby Jupp finally returns to competition after over two years of dealing with injury and wins a bronze medal at the Toyota International.